Senior portrait on the streets of Chicago. I hadn’t seen Todd in quite a few years since I took his sister’s senior pictures in Chicago in 2014. She tagged along to give him a helping hand and moral support as he did for her. We started the day with a Beats style photo shoot on the streets of Chicago and then made our way toward the lakefront. Listening to some tunes during a senior session in Chicago. Todd is interested in art and broadcasting so we stopped by the ABC Chicago 7 booth on State Street for some portraits. We then visited the Chicago River area and the the Mag Mile before heading out to the Museum Campus for some cityscape shots. Senior pictures among the skyscrapers on Michigan Avenue. Senior portraits in the Windy City. When we arrived at the Museum Campus area the sun had not gone down yet, so we took some cityscape portraits over the lake at dusk as well as at nightfall. Chilling out off of Lake Michigan as the sun goes down. Our last stop for this Portage High School student was night portraits in the streets of downtown Chicago. Senior pictures at night in downtown Chicago. This is merely a sneak peek with many more images to come from Todd’s senior pictures in Chicago. Follow the Instagram feed listed below and fill out the Contact Form to inquire about your own session. 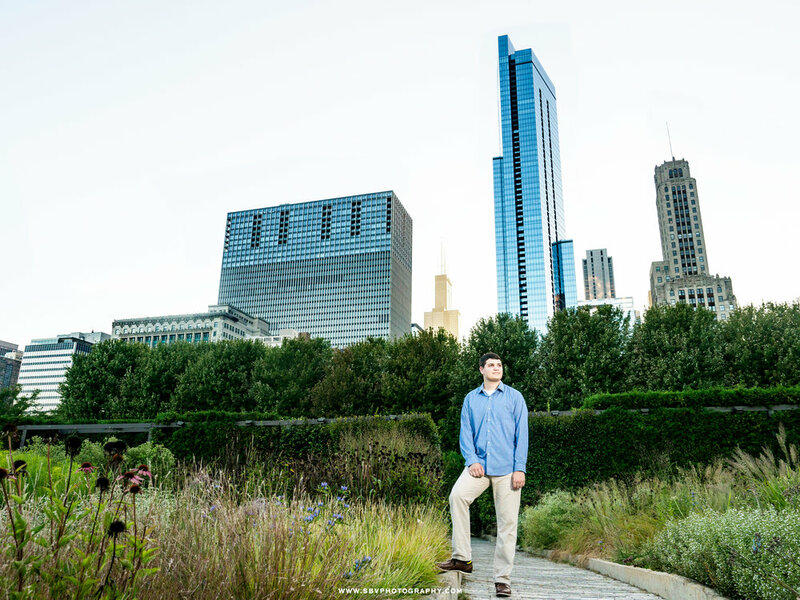 Hebron high school senior in Lurie Garden in Chicago. I spent Saturday afternoon with Hebron high school senior Ben and his family. We started our day in the Museum Campus area taking in the view of the city skyline from the shores of Lake Michigan. We then moved downtown for a more urban look. High school senior picture on the shore of Lake Michigan. Senior photos around downtown Chicago. We got dropped off right in front of the Art Institute on Michigan Avenue and took advantage of the great walkway that leads to the building entrance. Then we hit some graffiti walls along with various alleys. Senior portrait at the entrance of the Art Institute in Chicago. Urban senior portrait in Chicago. We had a very sunny day upon us, so I decided to shoot right up into the sun for some unique looks for Ben’s senior pictures. 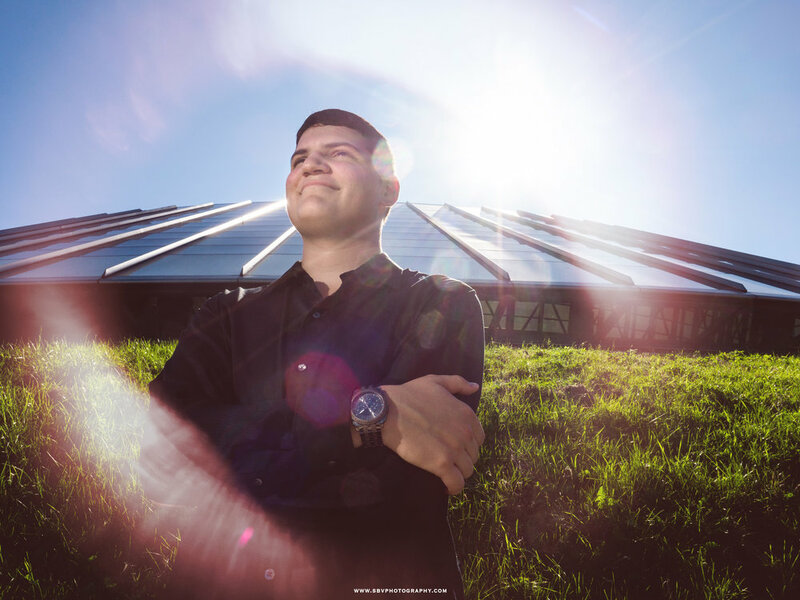 A ring of sun flare illuminates a high school senior in Chicago. Sun reflects off of a tall building on the State Street Bridge for an urban style senior photo. 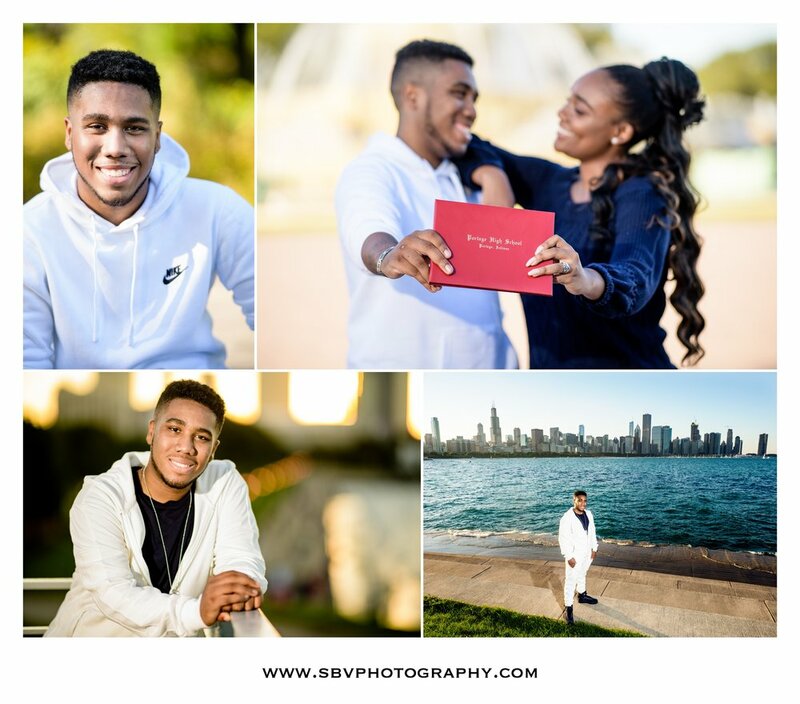 A collage of senior photos in downtown Chicago. This is merely a sneak peek look at Ben’s senior pictures in downtown Chicago. Be sure to follow the Instagram feed listed below and fill out the Contact Form for your own session.